One thing I love about my life in academia is its seasons. Living in Southern California, I find it difficult to distinguish between summer and winter by the weather, but I always know where I am in the year by the semester clock. I am always either approaching a new semester, bringing one to a close, or anticipating the next. Academic life is full of beginnings and endings, of fresh opportunities, and regrets at the daily (hourly?) mistakes of teaching and advising. While research just keeps moving forward at its own slow crawl, teaching is endlessly various. Marathons disguised as sprints. Fourteen week bundles gift-wrapped with intensity and pathos. Can you tell that another semester is about to end? The final week of class is always a period of mixed emotions for me. I am, every time, filled with gratitude that we all survived the long haul voyage we began together in that distant, nearly-forgotten past–three months ago. I have long since given up on the idea of using the last week to “catch up” on all the content that every semester I chuck overboard from my ambitious syllabi to keep the class afloat during the mid-semester wallow that always seems to bog down our progress. Instead, I think of the final week as a period of reflection and discussion with students. A kind of intensified advising period, with a bi-directional glance back at what we’ve accomplished and forward toward what comes next. Will students want to continue to study a certain type of writer, or issue, or problem? Will they NEVER EVER want to study a topic again? Will they, too, have a sense of arrival, of nearing a new port? Will the material or experience of their semester classes have nudged them into difference from their pre-semester selves? Will they, too, feel that they will need to regain their land legs as they adjust to their slightly shifted perceptions? I always leave a semester feeling transformed in some way. Do they? As we all swim to the surface of the semester, our perspectives change. The minutiae of the semester falls away, and the shared experience comes to the foreground. The frustrations with technology failing, missed deadlines, or experimental assignments fall away, and I am left with a sense of nostalgia. Each class, each semester, develops its own unique character. And the final week of each class I anticipate the approaching farewell with sadness. But, to be honest, also with JOY! School is almost over! Just as I yearned for the summer holidays in elementary school, so, too, do I yearn for the end of the intensity of the semester. Loved ya, class. But we’re all ready to move on, aren’t we? I’ve been participating–with varying degrees of engagement, though with unflagging enthusiasm–in #connected courses this fall. As with so many other MOOCs and mooc-like online learning experiences, I find myself most engaged by the small conversations that happen around the edges of the organized course content. This is why I like Twitter, I think. I like to dip my toe in the endless stream, to be aware of what people are talking about, to engage, to meet others, to browse some of the blogs I would never otherwise encounter. 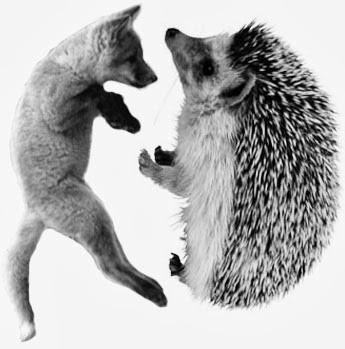 I am, I suspect, a fox by practice even if a hedgehog by conviction, to abuse Isaiah Berlin’s immortal metaphor. In other words, I like to separate myself intellectually and physically from the task at hand and move to another before the first is finished. Catch up with my own teaching and research obligations. Reconnect with my family life and my personal goals. Some people call this juggling. I think of it as an extension of my pleasure in browsing used book store shelves: even if I find a book I want to purchase right away, I love to look at all the others, to gather a pile of potential purchases and weigh them against each other before purchasing more than I can read in the near future. One thing I love about online learning is that I can engage in it in fits and starts; it gives me the pleasure of browsing among an endlessly fascinating variety, and putting off committing to any individual endeavor that will necessarily narrow–and deepen–my engagement. And this kind of self-paced engagement is, I am realizing, something my own students would love to do as well. Every semester, about halfway through, the energy in all my classes flags. I know that I need to step up my game this time of year, to plan a bit of a tap dance or sales job to help my students focus and commit to the topic at hand. Sometimes I’m more successful than others; but I always know I need to do more, to become not only professor but also entertainer-in-chief. I often try to plan “fun” assignments for mid-semester. When I teach Jane Austen, I schedule “Dance like Jane Austen” day at this point. Or this is when we watch a film in class and live tweet our comments rather than discuss them. Or learn to enrich the visual and aural and design-based elements of whatever multi-media blogging platform we’re using that semester. This semester, for example, my students will be playing a game on Twitter, though that won’t begin for a couple more weeks. What does this have to do with public scholarship? I’ve been thinking about how to inspire my students to redouble their efforts and reengage in the academic challenge, which has caused me to consider, as I so often do around this time of year, how to teach better next time around. My lightbulb moment: I want to propose for next year: Seminar in Public Scholarship. I was thinking about “connected scholarship”, but while Mimi Ito’s work and all I’ve learned via this #connected courses experience is a huge influence on my thinking, I think my potential students will intuitively understand the word “public” more easily, as they browse their choices in the catalog. What would be the purpose, the “why” of this course? I teach at a small, private liberal arts college in California. Our students are the products of a public education system in California that has suffered decades of neglect and worse. As the Connected Learning Network’s “Agenda for Research and Design” points out, parents of children from wealthier backgrounds are pouring ever-greater resources into their children’s lives to compensate for the gaps in public education, while parents of less wealthy families do not have that same ability. Our students are often from California’s less wealthy families. Our students are often first generation collegians, seeking a college degree for the promise of a future that will catapult them into the kinds of jobs and careers that they desire–careers often defined by autonomy, flexibility, prestige, and relatively high financial remuneration. Unfortunately, as Ito et al state succinctly: “A college degree has become a requirement for most good jobs, but is no longer a guarantee of acquiring one” (17). Even if college is not a direct route to a “good job,” as many of my recently graduated students have discovered to their woe, I still believe that the work we do here, the learning that happens here, can be transformative and helpful in our students’ lives. But how? That’s the real question, and that the question that so many private colleges are asking themselves in today’s market, with the manifold burdens of rising tuition, skyrocketing student debt, and a meandering or uncertain path from liberal arts into the “good jobs” that so many of our graduates need and desire. I, a modest English professor who studies nineteenth century literature, am not going to solve all these social problems (though I am so very glad to read and benefit from the great work of folks like Mimi Ito, Elizabeth Losh, Cathy Davidson, Howard Rheingold, Gerald Graff, and many many more who together, I believe, will make a huge difference), but I do want to change my own teaching practice so that I address the real needs and concerns of my actual students. No surprise there, that’s a baseline value I imagine all #connectedcourses participants share. So, why do I imagine that a course titled something as obscure as “Seminar in Public Scholarship” will accomplish this? What do my students want from their college classes? They want to learn, to have access to a world larger than they understand and older than any of us can imagine. They want to have a teacher who is a guide and a mentor who will make sense of that world, who will shine a light that organizes all the seemingly unconnected or disconnected strands into a coherent and knowable package that will directly impact their own lives. They want an entertainer, who will transmit to them knowledge in delicious and endlessly various nuggets. They want a warm and caring human being, who will forgive them their human failings, and inspire them to become better versions of themselves. What I want, on the other hand, are students who do the learning themselves. Who look to me as an expert, but who enjoy the process of making new knowledge for themselves. And what I’ve realized is that these two concepts are not so very disparate. A few times in the past few years I’ve felt at moments that students’ needs and my own teaching desires were energizing each other. Twice now, I’ve felt close to achieving a surprising approximation of this kind of learning. This semester, teaching my connected courses class, and last year when teaching an Austen seminar which connected to both scholarly discourse and Austen pop-culture life online. In those two classes, especially, there were periods where students own interest was driving the content. This level of engagement was uneven among students, and waxes and waned during the semester. But the possibility that student interest could motivate class discussions, could enrich assignments so that students worked well beyond expectations, could obviate the need for “edutainment.” Now those are moments I savor. Finally: why a seminar in public scholarship? What I now think I want to try is to build a seminar that leads students through a few steps toward taking control of their own education. I keep working at this, and I think I’ve realized the missing ingredient. Students NEED access to all those qualities I listed above as their ideal teacher. And I, flawed and limited human that I am, cannot fulfill all those roles. On good days, maybe I’ll embody one or two. On bad days…well, enough said. I alone am not enough to enable my students to envision themselves into their own personal ideal, and stimulate them to work toward that ideal, and give them all the resources they need to get there, and console them for the difficulties they encounter along the way…etc. I think no single teacher actually is enough (though I know there are amazing teachers out there who get a LOT closer than I ever will). Maybe that’s why most academics I know live with a low level of “imposter syndrome” always at work in our souls. We see the need, and our inability to fill it, and we wilt a bit. So, my “Seminar in Public Scholarship” is born. I want to scaffold in a process by which students can find role models (in the largest sense) to help them articulate what kind of post-graduation person they want to become. Then, after they have created their own “why” for their education (or at least for their engagement in the individual course) then we can work on the literacies of twenty-first century connected learning. In the past, I’ve started with ideas, and skipped directly to skills. This time, next time, I will start with asking them to create their own “why”, their own image of their future “best self” so they can then learn those things that will help them become that self. Perhaps, like Eliot’s Dorothea, most of us spend ourselves in diffuse avenues. But maybe, if we are very lucky, we can become, like Dorothea, a positive benefit to the world we inherit. I know that the language I use of “best self” comes loaded with Ruskin’s assumptions and Victorian oversights, and that Dorothea is hardly a heroic role model. But these ideals live in my mind and inspire me to continue to work. And maybe–maybe my students need to find their own guiding light, who though limited and imperfect, might embody the values and strivings that inspire them? Sounds simple, doesn’t it? As I type out these final sentences, I realize that many of my #connected course colleagues are probably already doing versions of this. Please share your strategies in comments! Henry Jenkins. “Public Intellectuals: Theory and Practice”. A syllabus from 2013.